RELAX, REFRESH AND CLEANSE YOUR BODY & MIND .. IN JUST FIVE HOURS. Dinner catered by Epicured: Eat Well & Be Well. RETREAT FROM DIGITAL OVERSTIMULATION AND RECONNECT .. TO YOU. At this intimate retreat, limited to 18 people, you'll enter a state of deep relaxation and emerge feeling rejuvenated and restored. You'll also make lasting friendships with amazing people and enjoy a dinner party in a beautiful home off Union Square (with a greenhouse!). Participants report having "the most productive week of my life" after The Path Experience. On June 24th you're invited to a meditation and yoga experience followed by a dinner party .. unlike anything you've experienced before. This retreat is designed to reconnect you to your body, breath and intuition. 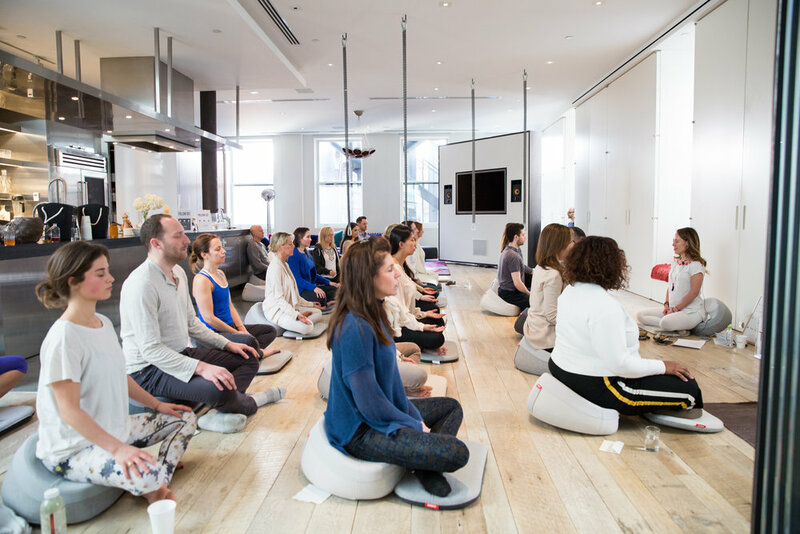 We'll gather at a beautiful home off Union Square for meditation, yoga, breathing exercises and more .. a retreat designed for first time meditators and people with years of experience. We'll also enjoy wisdom talks, group discussions, social time and breaks with gourmet snacks. You'll have a chance to meet and really connect with other mindful change-makers in the city. And you'll reenter the outside world from a different place. Feeling calm, centered .. and ready to follow your bliss. "I recommend it to anyone, especially my friends that think they can’t quiet their mind .. that have a hard time being present." "I got a sense of camaraderie out of this group retreat. Meditation is a very solitary practice, so I like the community and feeling like I’m not on this journey on my own." "The meditation left me feeling more at peace and open"
"It was fantastic - well timed, energetic, informative and fun. HIGHLY recommend." "You crafted a wonderful experience"
"My primary reasons for coming were to deepen (and broaden) my understanding of meditation and how to practice it, meet new people and have an uplifting and novel experience. You delivered on all those things." "I felt AMAZING. And I looked amazing too. I am going through a difficult life change at the moment and I felt as if I got my radiance back for the first time in a long time." "Everyone was so lovely and I felt rejuvenated yet calm and ready to spread the love throughout NYC!" "I felt great! Everyone was very easy to get along with and I feel like I met many interesting people as well." "Amazing. My face literally changed. I think I look 5 years younger!" "Much lighter and much more in tune with myself... rejunvinated to start meditation again." How can The Path Experience change you in just 5 hours? You'll enjoy three meditations & two yoga sessions, working from the outside in. We'll explore the five layers of being: the physical body, breath body, mind, intuition and our innermost core, the bliss body (yes we'll get to this!). We'll relax each layer so by the end of the retreat you'll have room .. to play .. and access your full creative potential. You'll also experience a shift in perspective and connect to what's really important for you. This is a powerful, uplifting and deeply restful experience, with a profound impact on your body and mind. On this day you'll go within. focus your attention. and make great new friends. Marlie McGovern, E-RYT, MA, created and leads Restorative Yoga Teacher Trainings for physicians, therapists, and caregivers. Marlie also teaches yoga at studios and at The Rubin Museum, Tibet House and New York University. She loves her 1:1 private classes and leading weekend retreats upstate. Marlie is also a teacher in The Path's Meditation Teacher Training program (in collaboration with Nalanda Institute and Pure Yoga) and is the voice of Calm City, a mobile meditation studio housed in a vintage RV, currently making its way around NYC neighborhoods. Marlie's educational background is in cultural anthropology and psychology. She holds Master of Arts degree from NYU and is a graduate of Nalanda Institute's Certificate Program in Contemplative Psychotherapy. Dina Kaplan is Founder of the The Path, which teaches meditation for the modern mind. The Path has taught thousands of people to meditate in New York, Los Angeles and during SXSW, Sundance and throughout the country. Dina is a certified meditation teacher and has led meditations across the country at festivals and conferences, for large and small groups, brands and individuals. She has studied and practiced dozens of meditation techniques, including Vipassana, Mindfulness-Based Stress Reduction, Vedic (or “mantra”) meditation, loving-kindness or (“metta”) meditation and more. Before founding The Path, Dina was co-founder and COO of the tech start-up Blip. Before Blip, Dina was an Emmy-award winning television news reporter for local NBC stations. Prior to reporting, Dina worked as an associate producer for MTV News and at the White House as Director of Research for the Office of the White House Counsel. Dina was named one of Fortune Magazine’s Most Powerful Women Entrepreneurs and Fast Company’s Most Influential Women of Web 2.0. She has written articles, including about living mindfully, for today.com, Marie Claire, Medium, Town & Country and Byline, the publication of the New York City Press Club. Dina has taught classes at Columbia Business School, Columbia Journalism School, NYU’s Stern School of Business and NYU’s ITP program for engineers and designers. She has spoken at SXSW, the World Economic Forum, Fortune Most Powerful Women Summit, DLD, Le Web, Cannes Lions, Monaco Media Forum and CeBit. for offering deliciousness during this retreat!